Norman Lindsay was born at Creswick, the third of six children in one of the most influential artist families in Australian art. Together with his elder brothers, Percy and Lionel, he had his first lessons from Walter Withers in his open-air studio at Creswick and from his brother Lionel, who encouraged and promoted him. A successful novelist as well as an illustrator, painter, maker of ships' models and etcher, Norman Lindsay settled in Springwood in the Blue Mountains, NSW in 1912 - his house is now a National Trust museum. Norman's children's story 'The magic pudding', first published in 1918, remains a favourite among children's books; his first novel 'Redheap' (1930) was originally banned. Exceptionally gifted, Norman Lindsay was the most controversial artist of his time. His brother Lionel introduced him to etching, which he quickly mastered, producing a technically varied and remarkably cohesive oeuvre of prints which remain among the most sought after of any Australian artist. Rose Lindsay, the artist's wife and printer of the majority of his etchings, compiled seven volumes of her husband's working proofs, including the drawings for them. These are now in the State Library of NSW, a remarkable record of Lindsay's methods as a printmaker. Proofs of all three states and two preparatory pencil drawings (one smaller, the other the same size) for this print are in volume one. 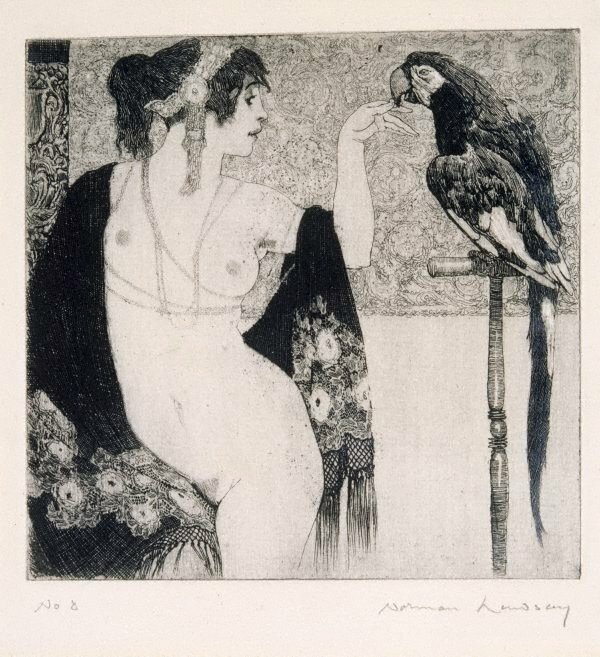 Inspired by Theophile Gautier's great romantic novel 'Mademoiselle de Maupin', first published in 1835, 'Lady and parrot' is one of Lindsay's earliest etchings. Signed l.r., pencil "Norman Lindsay". Not dated.